This book is for you and your children to read together. Every chapter teaches something new and helps put you - and your children - on the right track in your relationship with God. When you want to get to know someone, where do you start? How do you introduce yourself? Usually, you start with someone's name. God knows this - and he doesn't have just one name to share with us, either! The Bible gives us many names for God and tells us what they all mean. And when we learn a new name for God, we learn something new about him, too! 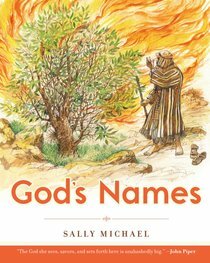 About "God's Names (Making Him Known Series)"
An ideal tool for parents to teach their early elementary age children about Gods character expressed through his names in the Bible. Each chapter ends with personal application and activity. Sally Michael is the co-founder of Children Desiring God and has developed a widely used Sunday school curriculum for young people. She is the Minister for Program Development and Resources in the Family Discipleship Department at Bethlehem Baptist Church, Minneapolis, Minnesota.